For over 70 years, BENDER has been a global leader in ground fault protection. From industrial plants to mines to hospitals, customers trust BENDER to protect their electrical systems. The Arthur N. Ulrich Company is the BENDER healthcare systems manufacturer's representative agency in Ohio, Indiana and Kentucky. Whether you're building out a new facility, renovating/retrofitting an existing facility and/or need service for existing isolated power panel installations - contact us today! Standards such as NFPA® 99 and CSA Z32 require isolated power systems or GFCI's in all areas deemed "wet procedure locations" in healthcare facilities. BENDER Isolated power systems offer an invaluable advantage compared to GFCI's - early detection of ground faults allows for critical systems to remain online in a single fault condition. BENDER isolated power panels provide isolated power to electrical systems in operating rooms and other critical care areas. Utilizing the latest in technology, BENDER equipment ensures that electrical ground faults are detected and located fast and automatically, in compliance with the latest standards and code requirements. BENDER isolated power panels for healthcare facilities conform to: NFPA® 99, NFPA® 70(NEC®), UL 1047, UL 1022, UL 50, CSA Z32, RETIE and AEA 90364-7-710. BENDER isolated power panels may also be equipped with a section for hospital grade power receptacles and/or ground jacks. 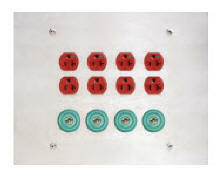 This panel configuration is ideally suited for having a centralized location for receptacles and ground jacks. 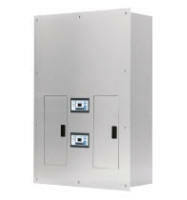 BENDER dual system isolated power panels contain two complete and separate isolated power systems in a single enclosure. Each system is independently configurable. 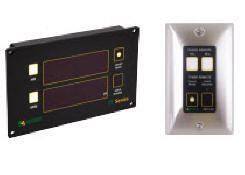 Dual system panels are ideally suited for locations where space is limited, or renovation/retrofit systems. BENDER isolated power panels may additionally be configured to feed x-ray and laser equipment at intervals up to 60A, within the power range of the panel. 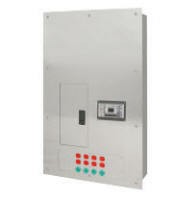 Power availability and lockout is controlled by means of a PLC. This control may be customized to meet specific system requirements. BENDER dual voltage isolated power panels provide two separate output voltages simultaneously utilizing a single isolation transformer. 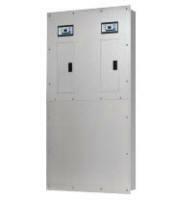 Typical configurations include one side configured for 208VAC or 240VAC, fixed at 15kVA. The second side is configured for 120VAC at 5kVA, 7.5kVA or 10kVA. Dual voltage panels are ideally suited for locations where space is limited, or installations requiring power for both hospital equip. and x-ray/laser receptacles. 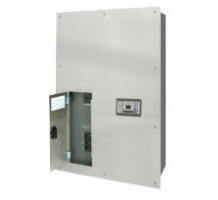 The LIM2010 line isolation monitor (LIM) measures the total hazard current (THC) in an isolated power system. 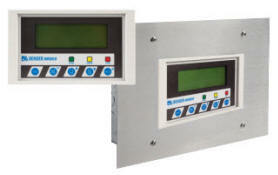 The LIM2010 is a full-featured device which includes a seven-segment display, digital display, and easy-to-read LED bar graph, connection monitoring, and compatibility with BENDER's ground fault location system and communication network. 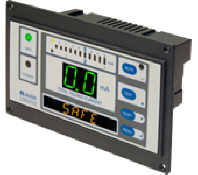 - MK2000 Series: Provides status for a single isolated power system, options for remote test. - MK2430 / MK800 Series: Provides status for multiple isolated power systems with customizable messages. - EDS461: Provides visual indication of fault and communicates to remote station, utilizes external current transformers. 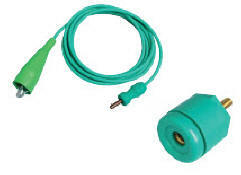 - EDS151: Communicates to remote station, utilizes integrated current transformers. - COM460IP: Provides easy-to-use, browser-based GUI for status of multiple isolated power systems, as well as a gateway for Modbus/TCP communication networks. - COM461MT: Provides gateway for Modbus/TCP networks. - COM462RTU: Provides gateway from Modbus/RTU networks. NFPA® 99 requires that line isolation monitor (LIM) and ground fault circuit interrupter (GFCI) tests can be conducted at regular intervals. The LT3000 is an effective and versatile testing instrument for easily fulfilling these requirements. The ZT1594 surgical chronometer is a complete, microprocessor based system that displays time of day and three elapsed times. 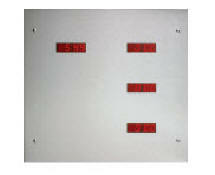 The system has four seven-segment displays with large, red LED characters easily read in high ambient light. 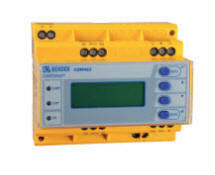 All features, as well as device setup, are carried out on the connected MK1554 chronometer remote. BENDER GPM series ground and power modules provide a combination of hospital grade power receptacles and/or ground jacks to satisfy the requirements of general and critical care areas. Ground and power modules are designed in strict compliance with UL467, UL50, the NFPA® 70 (National Electric Code) and NFPA® 99. BENDER XRM series x-ray/laser receptacle modules provide a convenient source of power for portable x-ray and laser equipment. Designed in strict compliance with UL standards, the XRM modules are a high quality outlet device accessory that is fully compatible with BENDER isolated power panels. The ZT1590 & ZT1590RS digital clock and timer is a complete, microprocessor-based device that displays both time of day and elapsed time information. It has a dual-row, 7-segment display with large, red LED characters, easily read in high ambient light. All features as well as the device setup, may be carried out with the four, onboard pushbuttons, or an optionally connected MK1550 clock remote. 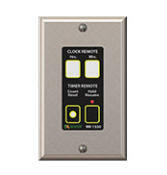 The MK1550 is a clock remote for use with the ZT1590 digital clock and timer. The MK1550 duplicates all functions of the ZT1590 and may be installed in a remote location. 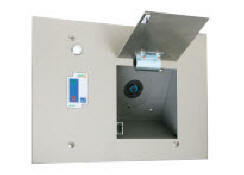 The MK1550 mounts in a standard single-gang electrical box. 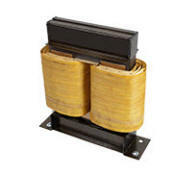 BENDER's hospital grade isolation transformers provide isolation between configured primary and secondary voltages. Standard single-phase transformers are configured at the factory for a single primary voltage and a single secondary voltage. Dual secondary transformers are configured at the factory for a single primary voltage, a secondary voltage, and an additional secondary voltage rated for 120VAC. 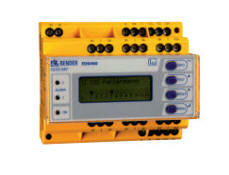 BENDER HGC and HGJ models are hospital grade outlet devices for the supply and grounding of portable equipment. Various lengths are available for ground cords, featuring highly flexible wire with a heavy-duty clip or lug at one end. Products are UL 1047 listed.